Members of the 133rd Engineer Battalion stand at attention during a Heroes' Send-Off ceremony in the Portland Exposition Building on Aug. 10, 2013. 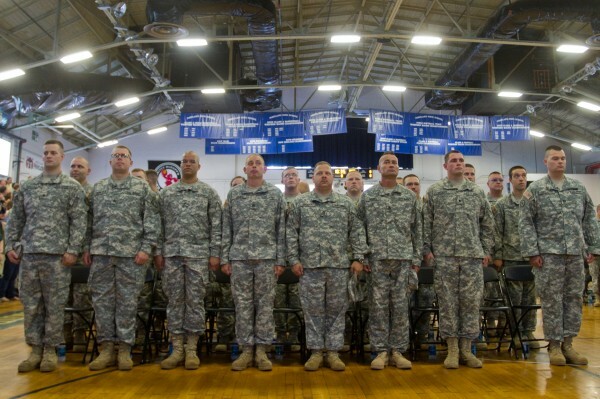 AUGUSTA, Maine — Members of Maine’s congressional delegation are seeking more information about a plan to restructure the Army National Guard that could send Maine’s 133rd Engineer Battalion to Pennsylvania, officials said Thursday. The proposal would essentially remove the 500-person battalion that has roots in the state dating back to the early 1800s in an effort to save money by consolidating Army Guard units nationwide. An infantry unit would move to Maine to take its place. There are currently 167 members of the 133rd deployed in Afghanistan working to downsize and consolidate the bases there as the United States prepares to withdraw its remaining military forces from the country. If the restructuring proposal goes forward, the 133rd would be moved to Pennsylvania sometime between 2017 and 2019, said Willy Ritch, spokesman for Democratic Rep. Chellie Pingree. “Nothing is set in stone,” Sgt. 1st Class Pete Morrison, spokesman for the Maine National Guard, said Thursday. Information about the plan surfaced when Maine Army National Guard Col. Jack Mosher briefed some members of Maine’s congressional leadership in Washington, D.C., on Tuesday. The briefing apparently did not include Gov. Paul LePage, commander-in-chief of the Maine National Guard, who called the Portland Press Herald Wednesday to ask about the source of its story. Maj. Michael Steinbuchel, spokesman for the Maine Army National Guard, referred all questions about the proposal to Peter Steele, LePage’s spokesman, who did not respond to repeated requests for information on Thursday. Ritch said he and other congressional staffers listened in on the Washington briefing by conference call from Maine and that other individual briefings were given to U.S. Sen. Angus King and other Maine leaders. U.S. Rep. Mike Michaud, a Democrat who is running for governor, is learning all he can about the proposal, Dan Rafter, Michaud’s spokesman, said in a Thursday email. Campbell, adjutant general for the Maine National Guard, is overseas and an email sent to him Thursday was not immediately returned. The change would affect guard personnel from all over the state. The 133rd is made up of soldiers from the 136th Engineering Company in Skowhegan and Lewiston, 185th Engineering Support Company from Caribou, 251st Engineering Company SAPPER of Norway, the Forward Support Company in Portland, Headquarters Support Company, the 262nd Engineering Company based in Belfast and Westbrook, and the 1035th Survey and Design Team of Gardiner. The Maine soldiers currently deployed overseas are part of the Headquarters Company, Forward Support Company and the 1035th, Steinbuchel has said. Morrison said Maine’s 133rd is the oldest unit in the state and has a distinguished reputation. The engineering unit is available to respond to natural disasters and completes community outreach projects every year, Ritch said. U.S. Sens. Susan Collins and Angus King issued a joint statement Thursday saying they would be looking into the matter. Shortly after news about the proposed change was released, Mainers started to call their congressional leaders. Correction: An earlier version of this story stated that Willy Ritch, spokesman for Democratic Rep. Chellie Pingree, said the briefing also was given to U.S. Rep. Mike Michaud. It was given to Sen. Angus King and other Maine leaders.